Minnesota faces real challenges to life and human dignity. 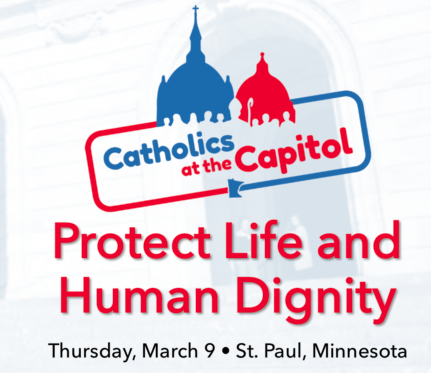 Catholics are called to respond and on March 9th Minnesota’s bishops, dynamic Church speakers, and over 1,000 Catholics from across the state will convene in St. Paul for Catholics at the Capitol, a day of inspiration and advocacy organized by the Minnesota Catholic Conference. Topics to be addressed include assisted suicide, school choice, and support for struggling families. Attendees will be informed about the issues, inspired to bring their faith into the public square, and equipped to have meaningful conversations with their legislators. Among the attendees and making the four-hour drive from White Earth, MN will be Oblate Fr. John Cox, OMI, of St. Ann’s parish along with others from the diocese of Crookston, Minnesota traveling by bus. Fr. John Cox, OMI, with Fr. Joe Hitpas, OMI, and Fr. Dan Nassaney, OMI, serve the Catholic community of the White Earth Indian (Ojibwe) Reservation in Northwestern Minnesota. Fr. John will lead the group visiting legislators representing Minnesota State District 2.